Gramat turned out as a very nice little city finally with some social life, offering all varieties of food and drinks, shops, etc. 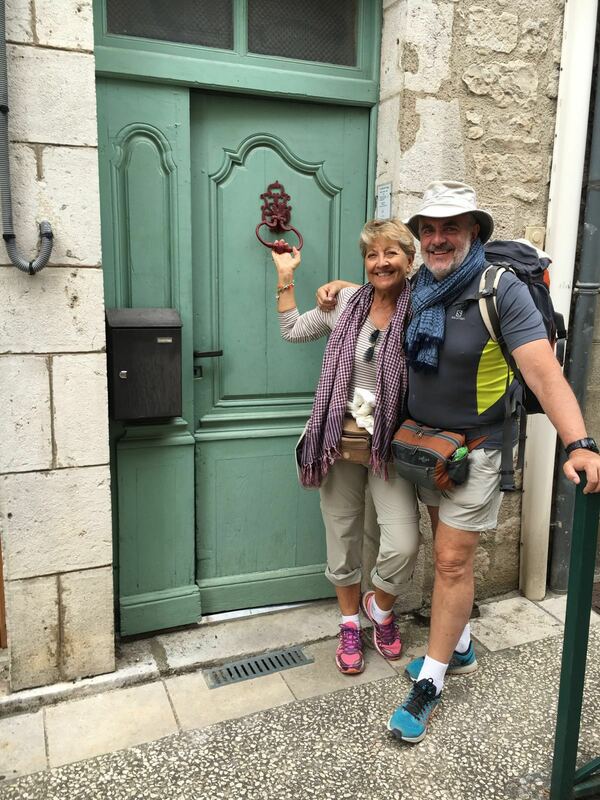 We ended up to select a favourite restaurant, le Coeur Gourmand, known for its simple but freshly prepared meals. We also could shop for our packed lunch for the day ahead, and opted for some Couscous and ham, with the unmissable baguette and croissants. On hindsight, we should have spent there more than one night, but knowing that the end of our journey was almost near, we wanted to move on through the last stage. Not long after having left Gramat behind, the trail descended rapidly into a canyon escavated over the centuries by the Alzou river, which apparently should have had originally a very turbolent life in his younger dsys with many rapids and waterfalls, but now reduced to be pretty dry riverbed at least during the summer season. As silent witnesses of its past, at the bottom of the canyon there are a number of ruined water mills, indicating very significant changes in the economy of the valley in the last 200 years or so. Finally the canyon opens up and the trails turns into a dirt road with clear signs of many cars either parked at the roadside or waiting to pulling into a wide parking area with many people walking in and out or having picnics with their families. 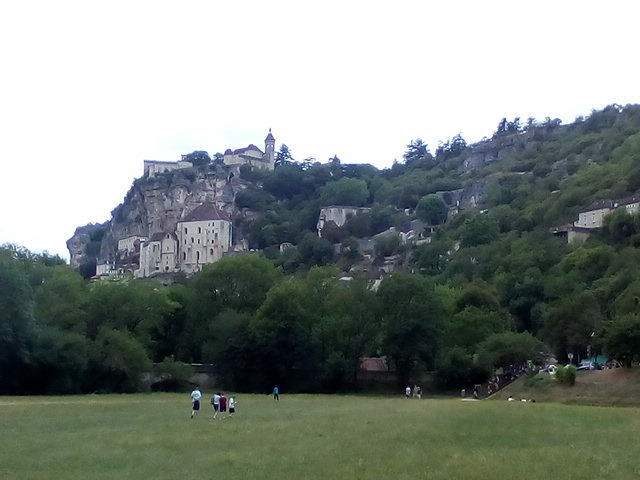 To be frank, the massive display of touristic mess is quite a turn off, but the sudden appearance of the layered structure of the Rocamadour village. Sanctuary, Rocks and the Castle, took literally my breath away. We have made it at least for the physical side. We stood in contemplation in that very spot for a few minutes, trying to absorb all the mixture or elation, excitement, amazement and other complicated feelings that surfaced all together. 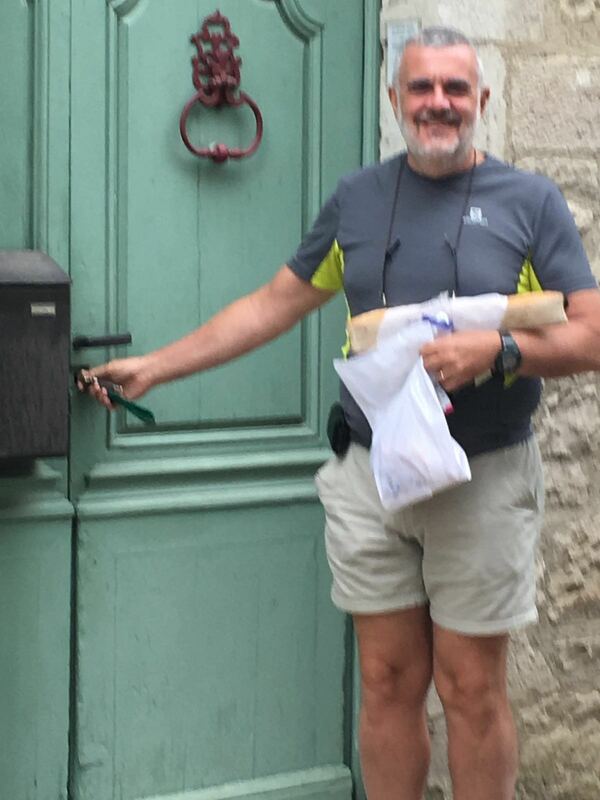 This entry was posted in Via Podiensis (From Conques to Cahors via Rocamadour). Bookmark the permalink. ← Day 8, Stage 6 from Rudelle to Gramat, start at 9:03 for 5:32 hrs, total 18:40 km.